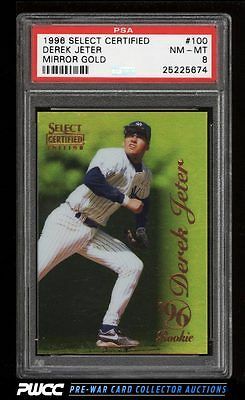 Exceedingly difficult Jeter rookie to locate in any condition, let alone in beautiful NM-MT condition. A rare and elusive card with fantastic surfaces and edges. A light touch to the upper left corner appears to be all that prevents a higher assessment. One of nearly 20,000 cards, lots, and sets up for bid in our 7th Auction of 2016. Click on the link above to view the other PWCC auction lots.